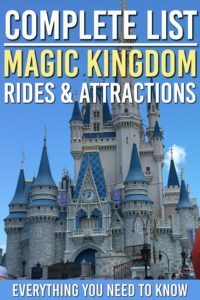 Magic Kingdom Rides and Attractions: The Complete List! Disney’s Magic Kingdom Rides offer something for everyone. The rides and attractions in Magic Kingdom range from young toddlers to thrill seekers, and everywhere in between. In fact there are so many rides in Magic Kingdom that it can be overwhelming. Don’t fear. 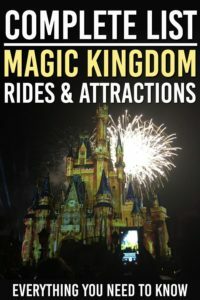 We have a breakdown of all the Magic Kingdom rides and attractions so you can pick the ones that are right for you. This is the entrance (and exit) to the park, here you will find the various shops and restaurants. It’s also where the parade takes place midday, and where you can get incredible pictures of the nighttime firework spectacle. Here you can meet Mickey Mouse and Tinkerbell. This is possible for Fastpasses, but you would likely be best to meet Mickey Mouse at one of the character meals in one of the other parks. This is a great way to see the whole park and get around to different lands if you have little ones who are tired. It’s also covered so it’s a nice way to escape the sun (but not the heat). The ride that started a blockbuster movie franchise, if you love the movies, this one is a must. Even the rides line is an entertaining walk through tunnels down to the boats. The kids loved this ride and it’s got the novelty of the movies behind it now. We liked it but only needed to do it once (unlike other rides in the park where we did them over and over again). This is one I would book a FastPass for later on in the morning when it’s a little hotter, or save it for later on in the day as you book your extra FastPasses. It’s a little dated but getting to see Captain Jack Sparrow is pretty cool. This cruise through the jungle is a delight. The animatronics are a little old, but it still pleases everyone who goes for the ride. I was surprised that this ride had such long line ups from first thing in the morning. I like this ride, we did it a few times and each captain of the boat had a constant barrage of one liners that made everyone laugh (and the occasional moan). This should be added to the list of must do rides, but see if you can use a 4th or 5th Fastpass later on in the day. This attraction is a massive tree house straight out of the book. You get to walk through all of the different parts of this gi-normous treehouse. While your kids may not know about the Swiss Family Robinson (strange there isn’t a newer movie made about it), this treehouse is an easy walk through and a great way to spend 10 minutes while you wait for your next FastPasses to come up. This is a pretty basic ride, it’s a midway fair style ride that spins around and the kids get to control the height of their magic carpet. Our kids couldn’t get enough of this one. The lineups were pretty short compared to other rides in Adventureland, and Fastpass was easy to get at different parts in the day. This bird spectacle is starting to show it’s age, but the animatronics in it are still pretty impressive. If you aren’t into shows, you could give this a skip, but if you and the kids need to sit down for a bit, then this might just be what you are looking for. Who doesn’t love to shoot at targets and watch what happens? This is exactly as described, a shootin’ range, where you pay to play, there usually isn’t a line up, but it’s up to you if you want to spend your time there. Personally we took one look, though “Cool” and moved on to more interesting things in Frontierland. This is a rollercoaster is set in a old western mining town and is a must for anyone going to the Magic Kingdom, it’s by far one of the best rides of the whole park. It’s pretty light first thing in the morning so you can get on it fast (we rode it 4 times in a row before the lineups started to form). As far as rollercoasters go it’s a relatively tame one, but still a lot of fun, it’s perfect for the whole family. This animatronic show set to country music is a great way to sneak the kids from the heat. It’s pretty entertaining and a great way to fill time in between your Fastpass rides. This play area has a lot of things to offer, but there is no ride. It’s a great place for kids to play around and if you are in Frontierland you could give it a go. Personally we passed on it because of time. There were other rides that we wanted to see more. This is a rollercoaster water style log ride. You will get wet. Go through the Briar Patch with Bre’r rabbit and enjoy this ride that tells his story. There are a few drops that you see from standing outside of the ride. and they look intense, but they are pretty calm when you are on them. Depending on your family it may be a good one for them to get their feet wet, (pun intended) before moving on to bigger rollercoasters like Space Mountain. Note: because this one has water, it’s more likely to break down, make sure you get to this one earlier on in your day, just make sure you have a poncho, or a way to cover up your Disney day backpack. This animatronic show of the presidents of the United States is a cool thing to see. You may never get to meet a President, but getting to see these ones in action is a pretty cool experience. They highlight acheivements of past Presidents and is narrated by Morgan Freeman. Kids may not find it as great as the other shows, but adults my enjoy the detail that has gone into this specatacle. This takes you around Tom Sawyer Island and takes you for a ride into the past to see animatronic wildlife and view the way people used to live. While not an exciting ride it is a peaceful one for little kids. This haunted house is a moving car ride back in time. The kids will find it amusing and the adults will wonder how they could make some of these ghosts appear. It’s not scary, though depening on your childs’ age you may want to hold off. Ours were fine at 7 and 9, and there were quite a few younger children in front of us. Just depends on your famililes level of spookiness. Tips: Another one that you can get passes for throughout the day. We booked it early and didn’t need it. Another one that might be nice to have later in the day so you can get out of the heat. I wouldn’t make this one of your first 3 unless you really want to see it. A rollercoaster ride that is one of the newer rides to be added to the Magic Kingdom. The ride is more adventurous than Thunder Mountain but less than Space Mountain. The ride can get long line ups pretty early on so make sure you get a FastPass for this one. This a fun carousel to go on, as far as carrousels go. It’s amazing to think how rides have evolved from this to the other rides you find throughout Disney World. 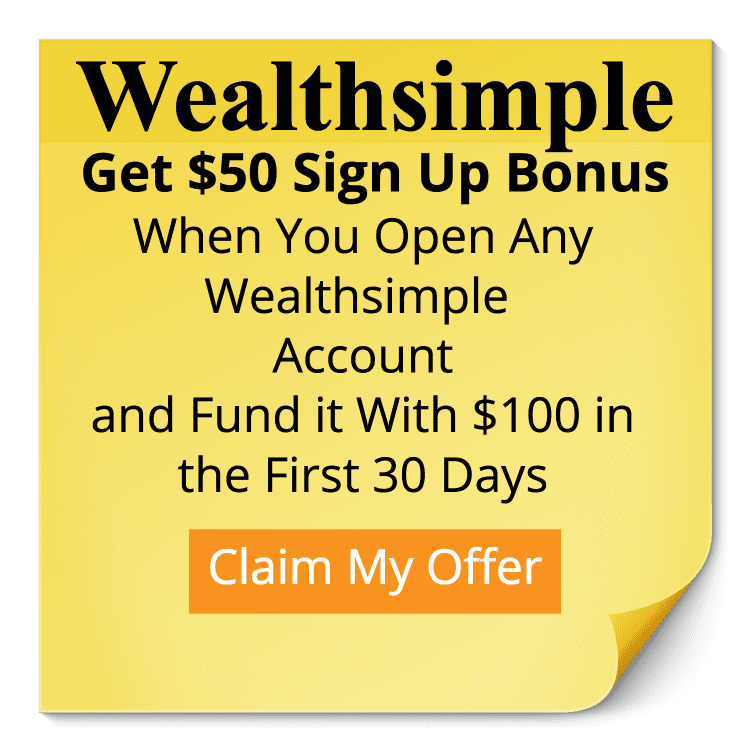 It’s great for little ones and is usually pretty easy to get access to. The ride retells the story of the Little Mermaid, I would add this one to your list of rides to go on with little ones or anyone who is a fan of the movie. The retelling of it is sure to bring back fond memories. If you are looking to meet and greet some princesses this is the place to do it. There are usually 2 princesses on duty and you can meet them and get your photo taken along with autographs. This is one of the longer waits so it’s a good idea to Fast Pass this one. It’s a very cool ride and perfect for all ages. I’m not sure how old of a ride it is but it felt a lot new than some of the other rides. Ariel’s Grotto is a great place to meet and greet Ariel, it’s up to you if you want to spend your time in the park doing this or use it elsewhere. It’s a midway ride Disney-style that allows you to fly with Dumbo up and down. Comparably it’s very similar to Aladdin’s Flying Carpets so if you are doing one you may want to pick one that suits you best. The kids will love getting to fly and control Dumbo but you can get a FastPass for this later on in the day fairly easily. This is a pretty tame midway rollercoaster. It’s a very short ride (we’re talking less than a minute) but maybe a great introduction to rollercoasters for your little ones. Our kids loved this one. This is an interactive meet and greet with Belle while she tells the children a story. They are chosen to play parts in the story and many kids want to repeat this one (if your kids aren’t in to participating, they don’t need to). If you have a Beauty and the Beast lover, this one is a must for the little ones to experience. This boat ride through the different dolls of the world and you get to view different cultures on the boat. It’s a little much with the same song repeated over and over in different languages, but it’s an intriguing way to teach little ones about other parts of the world. This is a meet and greet with Merdia, you can get your picture taken and get your autograph with Disney’s Scottish Princess. The Mad Tea Party is a midway ride that has teacups that spin you around and around. My family did it while I watched, I can get motion sickness and this one definitely would have set that off. This is an indoor ride where you go on a track through various scenes from the Hundred Acre Woods. Pooh and all his friends are there for you to see and if you are a Winnie the Pooh fan (guilty) then you will enjoy this ride. It’s in the dark, so if you are wondering how your little ones might hold up in dark rides (say, before the Haunted Mansion) this ride might be a good way to tell if they are up for this style of amusement park ride. Mickey’s Philharmagic is a 3D movie about Donald Duck scrambling to get things to get for a concert. It’s pretty entertaining and an easy way to get a little sit down in the middle of a busy day. We enjoyed this ride and getting to go through a shooting gallery that is all about Buzz Lightyear and the universe that is created around this toy. This had a pretty long line up throughout the day. If you are wanting to skip the lines make this one of your initial FastPass bookings. The kids loved getting to drive a car on this racetrack, but it’s something you could easily get a FastPass for later on in the day. We got them at the last minute several times. If your kids have any interest in driving a car (it stays on a track the whole time) then this is a great ride for them . Space Mountain is a rollercoaster ride that is largely in the dark. Unlike the other rolloercoasters in Disney World this one you sit single file. So if you have little ones that need you next to them, then this one is a pass. It’s by far the most adventurous ride in the park. For rolloercoaster enthusiasts it could be considered tame, but if you are looking for a fun thrill ride rollercoaster, this is it. This is a cool little ride. The people mover of tomorrow, you are elevated and are moved around Tomorrowland to see all this land has to offer. It’s not air conditioned but it does provide some relief from the sun and you can get off your feet for a while. Great comedy show that’s interactive and air conditioned. Great for the kids and adults alike. Our kids wanted to do this one repeatedly. Originally conceived for the world’s fair in 1964-65. It’s another show that has been updated and provides a nice escape from the Florida heat. I’m not sure what to say about this. One child loved it, the other didn’t. It’s pretty amazing to see what they have done over the years with this ride (I use the word ride but you sit in a theater and move around the stage). Share this with others so they don’t miss out!